We are a small farm located near Fertile, SK. Fertile is a small town located in the extreme south-east corner of Saskatchewan. Currently, we only have a few horses, but are trying to expand, while maintaining our goals. 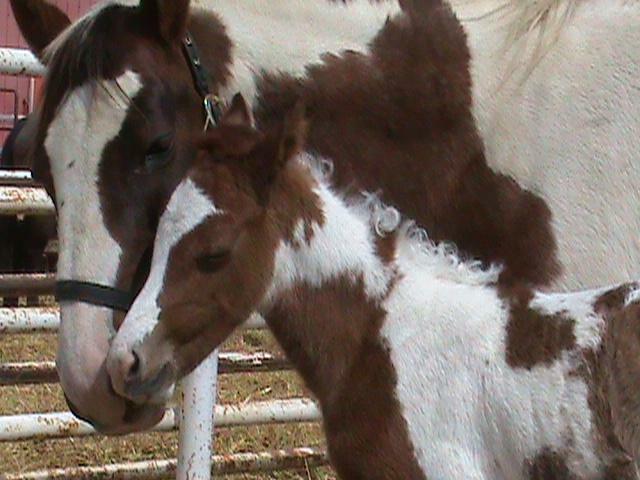 Duals Kokanee Gold and her new baby Durante at just 8 hours old! Our goal is to produce quality horses, with sound conformation and a quiet temperment. First and foremost in our minds are quiet, sociable horses, that can be put into any situation and excel. All of our horses are kept on a balanced diet and monitored closely to make any changes that may be needed. They are all regularily dewormed and visited by the farrier, and when necessary get their shots. By doing this we can ensure that any horse that leaves our farm is healthy and ready to go anywhere you want! Please check out our sales page regularily - we are constantly adding more horses, even in for our clients. You never know what you may find!